This paper will reconsider previous work on the demographic transition under way in West Papua (the Indonesian provinces of Papua and Papua Barat) in the light of documents received from the Indonesian Statistics Office (Badan Pusat Statistic BPS) that give an ethnic breakdown across the 29 regencies that comprise Papua province and the eleven regencies in Papua Barat. 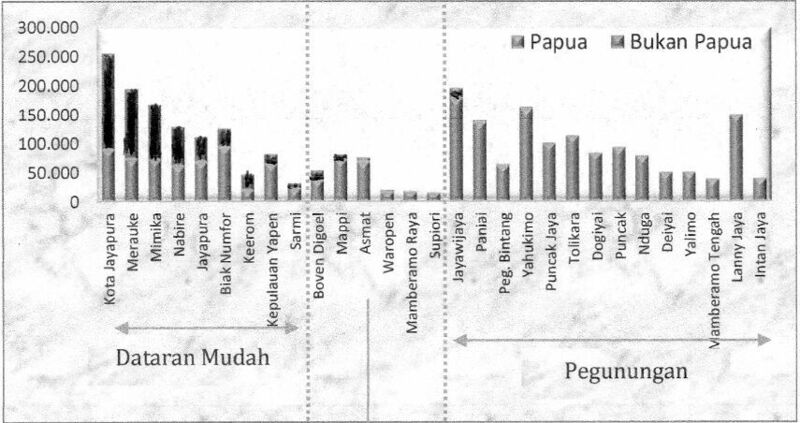 They show that, while the proportion of Papuan people as a percentage of the entire population continues to decline, this process varies widely between different regencies. 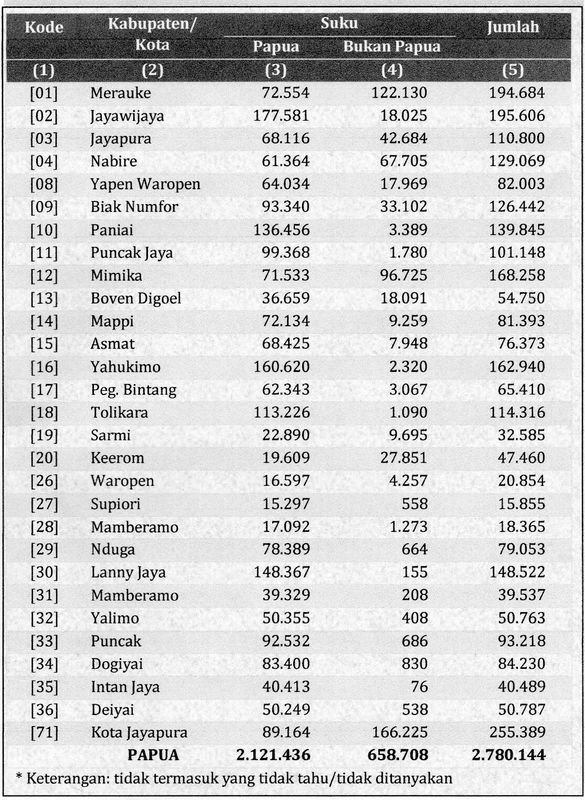 While some have a strong majority of non-Papuan people other regencies are still overwhelmingly Papuan. 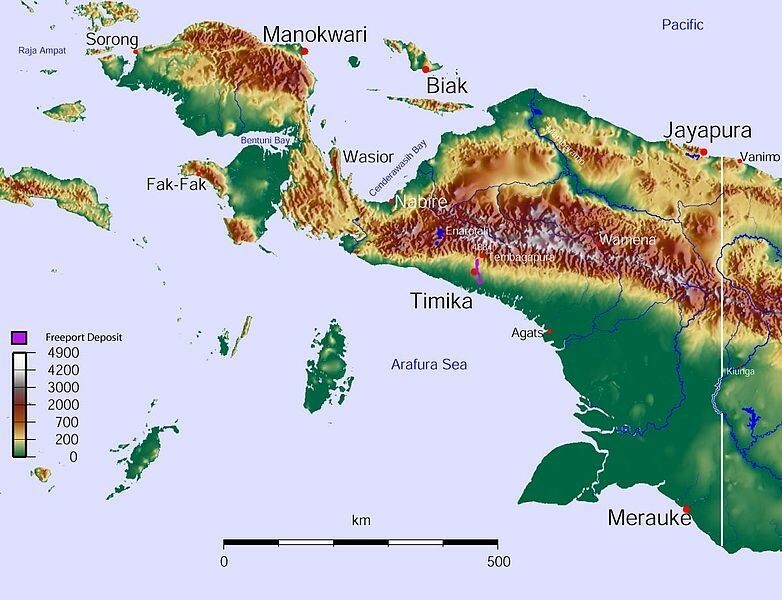 This dichotomy is closely linked with topography – the mountainous interior outside of urban areas having a Papuan majority and the accessible lowlands a non-Papuan majority. The consequences of this dichotomy – a large chunk of West Papua about the size of Great Britain is peopled almost exclusively by Melanesian people, even as some of the coastal regions become non-Papuan majority– is profound. West Papuans of the interior have not only survived Indonesian occupation but have kept their lands and cultures largely intact, which continues to underpin calls for an independent West Papua and conflict with the Indonesian government and its security forces. While coastal regions continue to receive large numbers of non-Papuan migrants resulting in the increasing minoritisation of the Papuan people and their concomitant militarization, marginalization and dispossession. This process is also occurring in the highlands from expansion of the oil/gas sector and mining sector; the proliferation of new regencies (with new bureaucracies) and the continuing development of new roads, all of which alienate traditional land and draw in migrants. 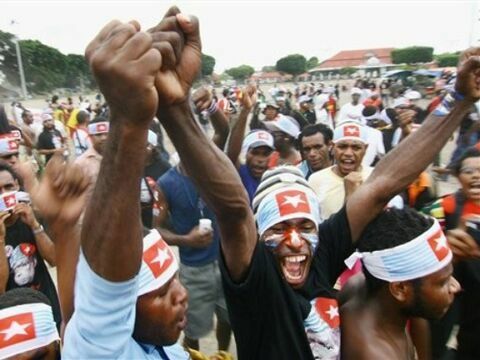 Meanwhile the conflict over the political status of West Papua will continue, and indeed grow, as external actors, such as the Pacific countries of Vanuatu and the Solomon Islands, shine a spotlight on the conflict and advocate for the right to self-determination for the West Papuan people. 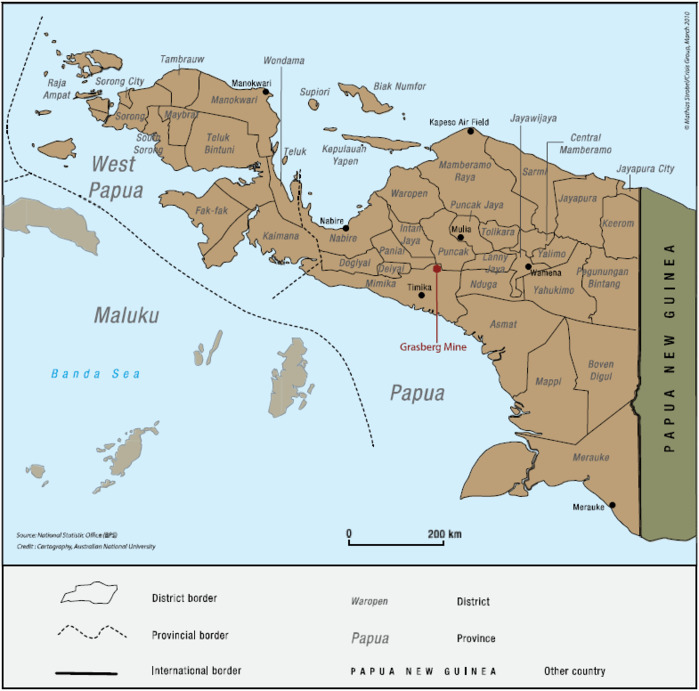 The territory of West Papua (the Indonesian provinces of Papua and Papua Barat) makes up about 24% of Indonesia’s total landmass but contains only 1.7% of the nation’s population. It is also Indonesia’s richest region in terms of natural resources with the largest extant tracts of rainforest in south-east Asia; vast oil and gas reserves, and possibly the world’s largest deposits of copper and gold. Indeed the Papua’s giant Freeport Mine is the largest economic entity in Indonesia and the country’s largest taxpayer. The author would like to thank Septer Manufandu for his insightful comments and assistance with this essay. 1For instance, West Papua: Genocide, Demographic Change, the Issue of ‘Intent’ and the Australia-Indonesia Security Treaty, Australia Institute of International Affairs, Adelaide, 23/10/06; Not Just a Disaster, Papuan Claims of Genocide Deserve to be taken Seriously, Inside Indonesia Issue 97, July-Sept. 2009; West Papuan Demographic Transition and the 2010 Indonesian Census: “Slow Motion Genocide” or Not?, Papua Papers No. 1, CPACS, University of Sydney, September, 2010. More recently with Camellia Webb-Gannon, A Slow Motion Genocide: Indonesian Rule in West Papua, Griffith Journal of Law and Human Dignity, Vol. 1(2), 2013, pp. 142-165. 2See West Papuan Demographic Transition and the 2010 Indonesian Census: “Slow Motion genocide” or not? Op. cit. 5Statistics on Ethnic Diversity in the Land of Papua, Indonesia, Aris Ananta; Dwi Retno Wilujeng Wahyu Utami; Nur Budi Handayani, Asia & Pacific Policy Studies, Vol. 3, Issue 3, September 2016, p. 3. 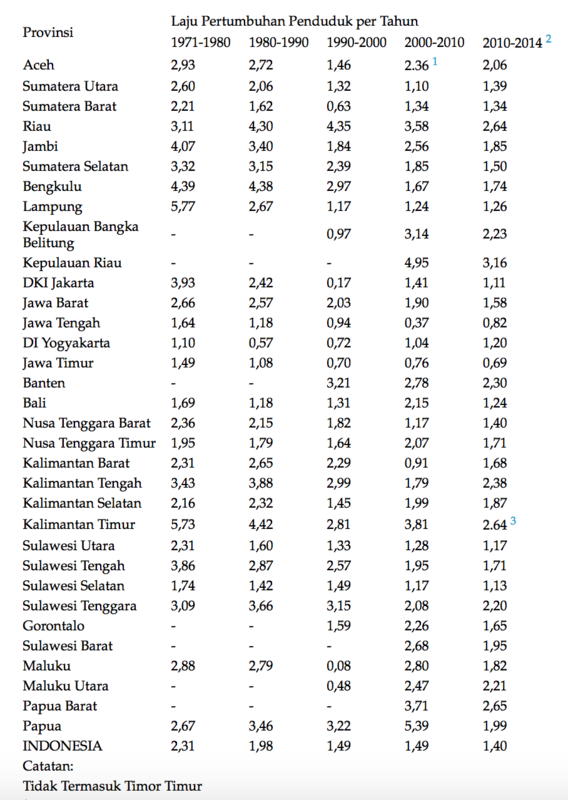 6There is some variance in the figures from the Badan Pusat Staistik of total populations etc. although these are statistically insignificant. 8This quote is from a paper presented by Emil Ola Kleden, ‘Papua, Indonesia and Climate Change’ for the conference, At The Intersection: Climate Change in the Pacific and Resource Exploitation in West Papua, organized by the West Papua Project at the University of Western Sydney on November 3-4, 2016. Kleden refers to Ananta, A., Evi Nurvidya Arifin, M. Sairi Hasbullah, Nur Budi Handayani, Agus Pramono, Demography of Indonesia’s Ethnicity, Institute of Southeast Asian Studies, Singapore, 2015, p.10. 10Statistics on Ethnic Diversity, op. cit. 11Cypri J. P. Dale and John Djonga, The Papuan Paradox: The Patterns of Social Injustice, the Violations of Right to Development, and the Failure of Affirmative Policies in Kabupaten Keerom, Papua, Yayasan Teratai Hati Papua, Arso, Keerom, Papua, and Sunspirit for Justice and Peace, Flores, NTT, Indonesia, 2011, slide 45. 13See Jim Elmslie and Cammi Webb-Gannon, A Slow-Motion Genocide: Indonesian Rule in West Papua, Griffith Journal of Law & Human Dignity, Vol. 1 2013, pp. 142-165. 14Confidential source with firsthand knowledge of conditions in Merauke. 15Personal comment from a Papuan source who related that many Papuan people are unused to the controlled and repetitive regime of industrial agriculture, and intensely bored from such occupations as security ‘guards’. 17For instance see, Jim Elmslie, West Papuan Demographic Transition and the 2010 Indonesian Census: “Slow Motion Genocide” or not?, Papua Papers No. 1, West Papua Project, Centre for Peace and Conflict Studies, University of Sydney, 2010, p.4.